Microsoft: Have you upgraded to Windows 10 yet? Me: Nope. Didn’t really get the time to do it yet. I’ll do it later. Microsoft: You do know that you are missing out on a lot of things, right? Me: Probably but my system works fine with Windows 7 for now. Microsoft: But Windows 10 is better. UPPGRAAADEE! Me: Later, man.. not now. Microsoft: HEEEEYYY!! Have you upgraded to Windows 10? Windows 10 is a great update from Microsoft. So much so that Microsoft has been calling it the last version of Windows since the future updates will be provided over this very core Windows 10 system. Windows 10 provides a lot of tweaks and improvements over the last version of Windows i.e. Windows 8 and Windows 8.1. Things like the whole new Start Menu, Universal Apps, Cortana etc. provide great functionality. They have also worked on making the whole operating system versatile to be used on desktops as well touch-based systems which is a great improvement over the last version of Windows. Microsoft has promised to provide free Windows 10 upgrade to people who are currently on Windows 7, Windows 8 and Windows 8.1. But not everyone wants an upgrade yet. Upgrades are not always good. Ask those people who upgraded from Windows XP to Windows Vista. Sometimes upgrading your device to a new operating system can turn out to be a horrible experience for you. Like I upgraded from Windows 7 to Windows 8 and until Microsoft released Windows 8.1, I suffered a lot. Windows 8 was not stable. It had a lot of bugs. Most of software drivers were not working. If you are running Windows 7 or Windows 8.1 then there is a free update to Windows 10 waiting for you. You might not want to upgrade to Windows 10 and in this post, I will show you how to stop automatic Windows 10 upgrade? There is a simple piece of software available which will help you preventing your computer to download Windows 10 upgrade files. Go to this link and download GWX Control Panel. Install it on your computer and stop Windows 10 upgrade by selecting the required options. 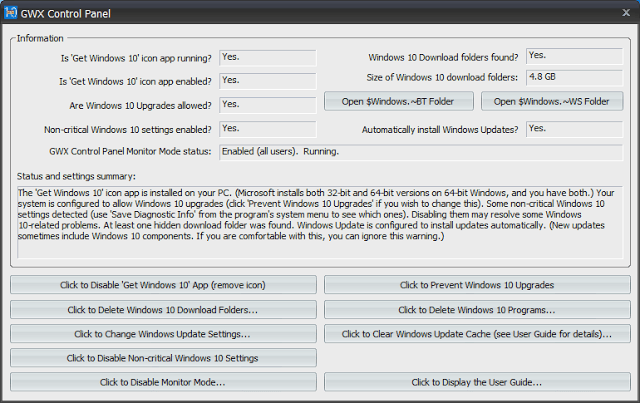 You can go to Control Panel > Windows Update and disable automatic updates. Windows will not download any update until you select manually. Your manually selected updates will be downloaded in background. Once download is completed, it will ask you whether you want to install them. Install updates manually to prevent automatic Windows 10 upgrade. Don’t select the ‘Never Install Updates’ option because then you will not be able to receive security patches and bug fixes. If you don’t want to install any third party software then there is kinda official way available to prevent Windows 10 upgrade. Go to this link (Windows 7 | Windows 8.1) and download patch for your operating system. Restart your computer and hopefully Windows 10 files will not be downloaded onto your computer. As mentioned before, there could be many reasons why one would want to disable automatic upgrades. One of them can be the familiarity of the current Windows version that someone might be using. Anyway, these were some of the ways in which you can easily stop automatic Windows 10 upgrade on windows 7 and 8/8.1.